Jag Jeans Christmas Treat, Join now and win Prizes! May your coming Christmas be as sweet as Christmas desserts from Jag Jeans. Founded in 1976, Jag is a formidable force in the clothing industry producing revolutionary denim designs and boldly going where no other brands have gone. Through the years Jag has been redefining jeans epitomized by the launch of Anti-fit by Jag in the 90’s. Jag then chose to defy the trends by introducing Skinny jeans at the peak of the boot cut fit hype. Jag skinny Jeans were endorsed by Angel Locsin and the game-changing ad campaign propelled Angel from mainstream fashion image to stylish celebrity. Until today, the brand is still known for innovative products that celebrate the Asian physique. The name “Jag” has always been synonymous with style, quality, and value for money. 1. React to this photo. 2. Share this photo on your timeline. 3. Post a glorious shot of your favorite Christmas dessert on the comments section of this photo! 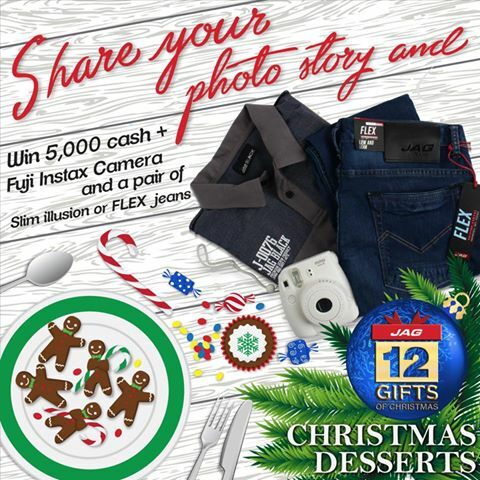 The winner will get P5,000 cash, a Fuji Instax Camera and a pair of Slim Illusion or FLEX jeans. DEADLINE of entries is on November 25 Friday 10 PM. A WINNER will be announced on November 26 Saturday. Don’t forget to set your post privacy to PUBLIC. *Non-winners may join again.